List Of Skylanders: Giants (And Release Dates) | Things That Go [BLEEP]! Due to the popularity of the original Skylanders: Spyro’s Adventures release thread, I decided to do one for Skylanders: Giants as well. If you have any information or if any of my information is incorrect, please post in the comments below and I’ll adjust this thread. I want to make this as good as a resource as it was for the previous Skylanders game! I’ll update it as I learn more information, so bookmark it and join us on Facebook! 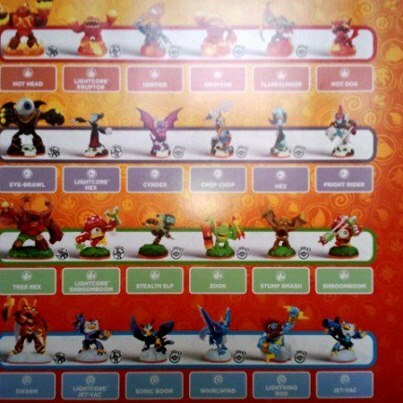 These pictures are a little blurry, but you can make out some of the new Skylanders. Click on the pictures to see a larger version. Any idea which stores will get Eye Brawl or Thumpback? Do you know when Ninjini will be released? Where are you getting your release info? 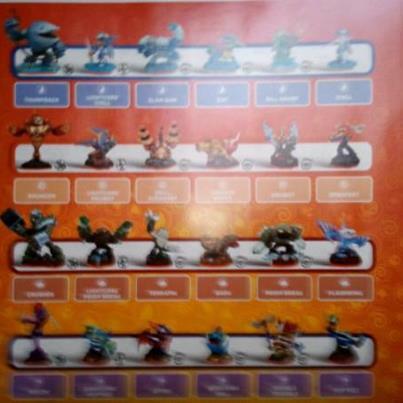 I have been looking everywhere to see when the second batch of skylander giants will be released. Thanks for any help you can give. Oh my gosh! Dude, you are so wrong! Thumpback still isn’t out. I am trying to get some giants for my two brother (3 and 10), but none of them are out. I hope they get ninjini in stores soon she looks awesome! Why is it that every skylander i like is not even in stores when the game comes out? Its actually Punch Pop Fizz. http://www.skylanders.com/giants/characters?char=lightcore%2Flightcore_hex … you were saying? I bought a Drobot Lightcore. You forgot him. Will Gnarly Tree Rex be sold as a single pack without the game? Plus the Target-exclusive Granite Crusher and the Walmart-exclusive glow-in-the-dark Series 2 Cynder in the starter pack. Where?!?!? We have checked Best Buy, Target, WalMart, Meijer, and Gamestop. Have not seen Hothead. Input please! what website did you get hotdog? can’t find him anywhere.. I didn’t forget them. They weren’t supposed to come out in October. They released them early. There is also a new legenday three pack exclusive to Toys R Us being released on Sunday with Slam Bam, Ignitor and Jet-Vac. I belive they are all Series 2. It is available for pre-order. You’re right, it is Jet Vac in the regular starter pack instead of Pop Fizz. My mistake. As for the legendary three pack, I don’t know about all the Toys R Us stores, but the one near me isn’t supposed to be getting it until November or December. ShroomBoom is available othe rplaces. The only part that is Gamestop exclusive is the cannon being gold. Every where else it is silver. What about the new Spyro figure? What’s the release date for that? I contacted Activision by postal mail to compliment the game and characters they have spent so much time making. It was a 2 page compliment. AND GUESS WHAT!!!!?!?!?!? They sent me the complete set of ALL the series 2 skylander giants along with all 5 of the giants I was missing. these are the ones i am missing too. I have not seen those specific 3 giants (Ninjini, Eye Brawl, Thumpback) either. Let’s keep each other informed via this forum. Thanks. I only need NInjini but i can not find her, does somebody know when she is coming out. PEASE send me the adress and LIST (most importantly) ! I’m in the same boat! Does anyone know when / where Hot Dog, Ninjini, Thumpback, and Eye-Brawl are being released? Before Christmas? I can’t justify a $40 preorder maybe for each! I hear suppose to be late nov. or early dec.
end of october i seen 1 hotdog at meijers & did not pick up at time not realizing would be hard to find later. hot dog is released 1/1/13. I just pre-ordered this 3 pack from gamestop today : Skylanders Giants Scorpion Striker Battle Pack (Hot Dog, Zap & ? are in it) It will be sent out on January 9. You can find hot head at Toys R Us online. See link in seperate message below if you need it. and one store had the wave 2 series accept jet-vac lc , hot-head but they have flashwing and so…. I finally bought Wham Shell after waiting forever by ordering it on line from Best Buy. Then I go to TRU and all the new giants had come out and they had a special case for free if you spent $100 on skylander stuff. It had a Wham Shell included! Now I have two!!! Which of the new giants? Did you see Ninjini, Thumpback, or Eye Brawl? Hot head is in stock at Toys R Us as of this morning! Please post if you see Thumpback, Ninjini, Eye Brawl or Hot Dog. yeah they do have thumpback and the other skylanders you said at Walmart. heeft iemand al andere giants gezien hier in belgie heb ik nu ook hot-head gevonden maar de andere zoals thumpback niet raar had gelezen dat ze met dezelfde wave kwamen als hot head maar zelfs jet vac heb ik niet gezien de lightcore dan. iemand een idee wanneer ze er zouden zijn? My 8 yr old son desperate for Hot Dog for christmas cannot find anywhere in UK !! I’m not sure about the UK but it is not in the US yet. I think it is part of the 3rd wave which is scheduled for release in January. If you stay in touch with me, I could be on the look out for it in the US in case it is released earlier. Honestly, I think you should offer him a picture of it or give him Hot Head instead…until you can get it. The comment was obviously posted BEFORE he was out. You really need to check the dates of when the comment you reply to was posted. That person posted tht BEFORE Eyebrawl was out. hi im a really big fan offcourse with the doughter and husband and it is saying that in america thumpback is out and even lc jet vac offcourse i know whe are behind now whit the skylanders collection but now i have found hot head but on activision it is said that lc jet vac is out now but not here in europe or belgium for that mather i would really like a notice when they are all coming out off the giants whe have all the 32+ skylanders adventure but she (my doughter) cant waint she even try to play assasins creed (against my better judsment ) and she want to have the new skylanders but why do they wait so long before they hit the shelves because in the first skylanders whe had them in 2 months offcourse whe looked at it severall times not reallising what the game is all a bouth but now where hooked on the game the hole family likes it young and old but everybody wants a fave so now my faver’s are flashwing ,slam bam ,giants hot head , legendary bouncer, lc prism breack but im waiting for lc jet vac .hope the waves comes faster so everybody can have a great chance too find the one faverite. i just wanted to know when hot dog was released? Is that just too much to ask for? Chris, What makes you think hot dog has been released? I haven’t seen him anywhere. Hot Dog was released in the Gamestop triple pack with Scorpion in the name on 1/10 or so in the US. I was told by GS that they had exclusive rights to Hot Dog for one month before the single packs would come out. If that is true, then single packs of Hot Dog could be available as early as Feb 10th….or so…. When will the rest of the giants be released in uk? When is Eye Brawl going to be released?? finaly i found hot-head in belgium but i hear that the release off thumpback was on black friday but here i hope to find him in belgium whe even have legendary bouncer so now she have 6 giants but still waiting for the rest though thumpback eyebrawl and ninjini. sometimes i have the feeling the kids need to wa&it too long and getting bored off waiting and dont want to play it anymore but i need too say now my little one she’s got 65 skylanders 54 figures and the rest are the g.cannon and the other adventure packs also. I have 7 giants but i only need Ninjini. If someone knows when she is coming out please i am begin you to tell me. I am from Canada and would like to know the release date for thumpback?? does anyone know hwen it will be released in Canada? my son asked for it from Santa and I was hoping to be able to get it for him. If anyone could let me know i sure would appreciate it. Thanks. I’ve seen release dates from Mid-December to January. Maybe he could get a picture of thumpback to trade for the real thing later. here in belgium they say monday 3 december for thumpback but if its treu??? nothing there is no jet vac liight core in belgium for sale in the stores yet only whe can do is sitting by and wath the commercial on tv and the sales on internet but why does anybody know. even game mania the best gamestore here dousnt even say anything or know anything. frustrated no activision?? anybody went to the store thumpback out?? Anyone heard any whispers about Uk release dates? What the heck! Where are the release dates for characters like Hotdog, Eyebrawl, etc. Does anyone know when these are coming out? When asking about the release dates for Eyebrawl, Hotdog, Ninjini, etc. I forgot to mention I am looking for the U.S. release. Please help !!!!!! Need to fricken know! rodbo30 so you got thumpback now?? On the website they are labelled by number. I am in the US and don’t see hot dog in any of the triple packs…but I may have missed it. Can you give more specifics as when I search for hot dog on the site…I don’t see it. Thank you! Pat, its called the scorpion striker battle pack. It has Hot dog , Zap and a catapult. Gamestop had it listed…looks like they have changed it though. It was listed as available Jan 1. Thanks, Joe. This is a great lead…as you can search for “Hot Dog” at gamestop but you won’t find it! But…there it is in the triple pack! Nice work! Now on to find Thumpback, Ninjini, and Eye Brawl! Sean: Who will carry the Scarlet Ninjini? Is this the one what will be available around Christmas? What about Slam Bam he is already out… True? What do you mean that you are “missing” an adventure pack? Do you mean it is not available to you? Have you tried GameStop (see post by Joe B). The pack has “Scorpion” in the title…see If Gamestop still has it for pre-release offer. I put in my order at the local store, but it looked like you could do it online if you pay for ship as well. Available for pick up 1/1/13 per current projections. I saw hot dog for a january 1 release in an adventure pack at gamestop still dont know about Ninjini, Thumpback or Eye brawl, been searching everywhere for when they come out. great a battle pack whit zap and hot dog with the scorpion striker but i have heard that they will be scattered over the year lets hope not and i want scarlet ninjini too but if its gonna be possible?? Ninjini, Hot Dog, Zap, Scorpion cannon, (item,) maybe eye-brawl, and thumpback will be released on (in the US) on Jan. 1, 2013. This is Activision’s 3rd “wave”. Note: there is a good chance that there’ll be a 4th wave too. It also seems that Activision has already made eye-brawl and hot dog characters, etc., but there were mistakes in the shipment, and some of those characters ended up in stores. I think it would be a good idea for parents to print out a picture of the skylander that their children want, and let them put two and two together, and figure that while they don’t have the character on Christmas Day, they’ll receive it later as an extra Christmas present, etc. does anyone think its strange that legendary stealth elf is out before the normal version? yes but now i have located the site that is saying that they are goiing to be released 23 of decemeber but whe have beeing dissapointed for many times over so d’ont promise your kid something she or he or they cant have till the next month hopfully whe will get a lucky year and maybe be can surprise our kids for real that’s christmas all about. Is this release date for U.S. or elsewhere? Why can’t I find the hot dog one anywhere? The chart says it was released in October. Are they gone? I saw one available in February. Thanks for any help. Grace and Peace! Yeah, sorry about that everyone. I don’t actually work on this site anymore. I’ve since moved on to BrokenJoysticks.net I do apologize about not keeping this up-to-date, but for whatever reason Activision & ToysForBob are very tight lipped about the release dates of the final Giants. I don’t understand why, but it is what it is. whe now have in belgium jet vac light core and legendary stelth elf too but no info for the rest of the giants thumpback eye-brawl or ninjini and yes 1 jan.2013 there should be a battle pack to come out whit zap s 2 scorpion strike and hot-dog but what whit the bigger giants who know’s? my gess is that they wont tell till there acctualy out because i have beeing on a qeust for legendary stelth elf but in one store i found light core jet vac and ordered legendary stelth elf so for now whe are sill waiting for the 3big giants 4 light cored giants smaller ones pop fizz hex and so on and ofcourse the hot dog but i have bought new toys and i must say they are verry pleased whit the things they dont yet know about but they know that skylanders made a mistake again because she has all 32 giants and adventure packs and the ones that are out now so she is happy she has 60 skylanders (total) and the adventure packs and the first golden cannon battle pack so she have a total of 72 items to play for now so yeah whe can wait but activision you have lost allot of money now. Third wave was set for release tomorrow, however I went to TRU today and that is pushed back until January ugh! Includes Ninjini 😦 the one I’m waiting for! Lightcore shroomboom has been released but in very limited quantities. It was released with the 4 other single characters that came out Dec 21st. Can you specify which store and which country for the 1/9 release? THX ordergiants if you got info for belgfium please let me know whe are waiting for hot dog ,zap the triple pack but when its out in the stores? I CANT WAIT TIL THUMPBACK COMES OUT!!!!!!!!!!!!! I found Stealth Elf Series 2 at Walmart in a single pack..
on 1-9-13 i finaly got skylandergiant lightningrod in toyrus in austin. i wonder where the first eye-brawl and ninjini are going to be sold at. That makes sense! Many of the ones on ebay are shipping from the West Coast of the US. Hopefully the “wave” will come to the East coast! I pre-ordered thumpback last month, still no sign of him. Activision needs to do a better job of releasing these things, instead of creating all this hype. NStone: If you are in the U.S., would you kindly share where you were able to pre-order outside of ebay? legendary Slam bam is released in a legendary pack with legendary Ignitor and legendary Jet-Vac. Wal-Mart and GameStop in the US both have limited copies of Thumpback and Eye Brawl. I picked up both last week at WM. Zoolert shows GameStop to have had several “in stock” periods today. I found eye-brawl at game stop. Yoshi: Would you kindly share a link for your eye-brawl deal, otherwise the info is not very helpful. Thank you for your consideration. Thanks, Howie! Thumpback is now gone, but I did get Eye Brawl! I think other people were checking out at the same time and Thumpback was taken out of my cart during the payment process. Oh, so close! Clerks at the local gamestop stores told me that they have had these Giants (EB and TB) in the past week or two. So…perhaps the wave is actually bringing Thumpback to us at last! Thanks everyone for your great posts!!! I found thumpback in wales in can’t belive wales has thumpback eyebrawl, ninjini will be coming out in 1 February or the maximum is 13 febuary hope that helped ninjini fans that is the UK release date in don’t know about the us release date. I got Thumpback, Eyebrawl and the Hot Dog 3-Pack at Game Stop today in Atlanta. Great! Thanks for sharing! I guess I’ll be doing another round of skylander stalking for Christmas 2013. Hope we have a great blog like this on which to communicate. Thanks everyone who left such awesome tips. We are still waiting on Ninjini. Any day now, right? I don’t work on this site anymore that’s why I haven’t updated it. I apologize, but I have moved on to BrokenJoysticks.net – that’s why it hasn’t been updated in so long. Again I apologize, I do visit every once in a while to see some of the comments, but I haven’t put up a new post on the site since August of last year. now they are 16 figures and you can make your own skylander cause off the 16 they can make over 250 characters how about that check skylanders swap force figures but i really like to have all giants and spyro’s too so it still have a long way to go but i just knew that skylanders would push it treu the end cause now they have a new way to play games for axample now you can make one figure in three pieces. do they ever update this page? i just got eye brawl and crusher yesterday. offcourse AND I LIVE IN EUROPE AND FOUND A SINGLE PACK OFF HOT DOG AND LC schroomboom now whe are waiting for the ninja called ninjini hope to find her and scralet too for the rest the series 2 are out here in bart smit wrecking ball ,spyro just lc hex, lc pop fizz ,lc chill and the one tech element drobot series 2 so FIVE more and the collection is complete for the normal ones not the glitter ones or legendary’s or so but that’s it for belgium here looks cool the new swap force figures and only 16 and you can make over 200 figures. Disney is getting into this type of game also. Star Wars first. Disney is getting into this type of game also. Star Wars first. I bet you won’t be running around looking for new characters all over town and I bet they will let you know the release dates too! Ninjini is on Gamestop Online. Hurry! Get them while they last. Ordered mine!!! pleeeeeeeeeeeeeeeeaaaaaaaaaaaaase someone tell me if spyro series 2 is out or ehen its release day is. I went to gamestop on wednsday and I say wrecking ball s2, but they said that they used to have spyro but it sold out. Also scarlet ninjini came out today. So you better hurry if you want it. But is there a specific release date for s2 spyro? Plus I live in maryland. does anyone know the exact release date for Ninjini? What’s up friends, nice post and pleasant arguments commented here, I am truly enjoying by these. Lightcore Hex is coming out with the swap force game at gamestop. I’ve seen it on sale quite a long time ago. Does anyone know the release date of lightcore Hex, Series 2 Drobot, and Polar Whirlwind in California? Finally got Lightcore Pop Fizz and lightcore Chill that were released in stores on June 3, 2013 at Toys R Us. assume you are knowledgeable in this subject. Fine together with your permission let me to grab your feed to stay updated with impending post. back as I’m attempting to create my own personal website and would like to know where you got this from or exactly what the theme is called. Cheers!